Ms. Krebiehl’s very interesting article reports on the effect of time on lees post secondary fermentation, and the effects of different dosages. LVMH comprises champagne brands Dom Pérignon, Ruinart, Moët & Chandon, Veuve Clicquot, Mercier and Krug, plus many other luxury goods businesses. Pernod-Ricard comprises champagne brands Mumm and Perrier-Jouët plus businesses involving many other wines and spirits. Vranken Pommery comprises brands Vranken, Pommery, Heidsieck Monopole and Charles Lafitte besides many other wine interests outside Champagne. Laurent-Perrier specialises in its own brand of champagne. Billecart-Salmon has won a significant victory in the French courts against the below-cost online sales of its champagnes. The House, which is celebrating its 200th anniversary this year, had appealed to the Commercial Court of Bordeaux, complaining of acts of unfair competition from the online sales company Cdiscount (Casino Group). The online sales company was accused having sold products ‘at abnormally low prices, in a commercial environment contrary to the high-end image of the house,’ reports La Revue de Vin de France of last 9 February. In order to stop ‘these unfair techniques’, the champagne house obtained permission from the commercial court for access to Casino Group’s ‘documents and invoices to identify the suppliers’. The Bordeaux Court of Appeal confirmed the merits of the order of the President of the Commercial Court and, in January 2017, the Court of Cassation validated the judgment of the Court of Appeal of Bordeaux of June 29, 2016. In addition, Billecart-Salmon’s products were ‘sold in areas unrelated to the field of wines and spirits; they were offered in a devaluing way, without their original packaging and reconditioned in an inappropriate packaging’, according to the judgment. The champagne company has been fighting for many years to protect the quality and upscale positioning of its champagnes and will continue to defend its interests every time they are breached, stated CEO François Roland-Billecart , in the plaintiff’s press release. Piper-Heidsieck will be served at the 2018 Oscars. And sister House, Charles Heidsieck has released the fourth Blanc de Millénaires – 2004. The other years were 1985, 1990 and 1995. The discerning Anna Kriebehl MW reports on the House’s director, Stephen Leroux’s, visit to London for the launch. So reports The Buyer, and I can’t wait to try the champagne, as I loved the last vintage, the 1995, so very much that I still have a few last bottles in the cellar. Can’t wait to compare! Pol Roger plans a new disgorgement and packing line, to be built over the site of a cellar collapse in 1900. Will buried bottles be found when they ensure that the ground underneath is sufficiently stable? And renowned cellar master Dominique Petit, who brought cold stabilisation to Pol, will be retiring later this year. This report is from The Drinks Business. Moët & Chandon, Dom Pérignon, Veuve Clicquot, Ruinart, Krug and Mercier experience sales growth of 4% in an otherwise flat market. The Drinks Business reports its conversation with LVMH’s head of champagne sales, Jerome Seignon. Barons de Rothschild will join Drappier and Laurent-Perrier in producing kosher prestige rosé champagne for the extra-strict Jewish market reports The Drinks Business. The champagne ranges of all three have been kosher for some time. sports a seasonal makeover of the deliciously fresh and fruity. So reports Glass of Bubbly. More from Anna Kriebehl MW, this time via The Wine Enthusiast, about glassware. I know that you know, but in case you require further persuasion, please click here. Guzzling method one, guzzling method two, over-chilling that masks aroma, flavour and texture, and using it as a mixer. Couldn’t agree more, and wish to add that using a badly shaped or poorly washed glass should be added to the list at Glass of Bubbly. We’re indebted to Champagne’s L’Union’s recent online reportage for the harvest information which follows, translated from the French for your benefit. The harvest of 2017 promised to be difficult, marked by weather-induced rotting and dilution. The sorting tables were indeed busy. Looking at the resulting still wines now, it doesn’t seem so bad, as oenologists report region by region. Chardonnays of the Côte des Blancs suffered less from the rains. Cédric Jacopin, Cellar Manager of the Union of Champagne in Avize, notes. ‘They are more resistant to botrytis than other grape varieties. We had moderate yields, with good maturity. The Chardonnays were picked very ripe, and offer great potential.’ He adds that the wines ‘are rich, powerful but of a nice freshness’. Charlotte de Sousa, also in Avize, confirms that the whites are ‘superb and very ripe’ and that the frozen plots gave ‘rarer and more concentrated’ grapes. Across all varieties and sectors, many have noticed a lack of vivacity. This indicates that these wines will be destined for quick rotation into non-vintage champagne. Sylvie Collas, Cellar Manager of J. de Telmont, works without malo-lactic fermentation. She finds the clear wines from Chardonnay to be less variable than other varieties. Laurent Parizot, oenologist in the Côte des Bar says that it is almost unanimous that 2017 was the year of the whites, which is difficult for vineyards very largely dedicated to Pinot Noir. For Vincent Martin, president of the Aube wine development group, Chardonnays ‘are more resilient to climate hazards’. And, he adds with humour, that in the Aube, Chardonnays are often ‘at the top of the slopes’. In other words, they suffered less from the nine consecutive days of frost in April 2017. For Michel Drappier, second largest maker by volume in the Aube, the atypical circumstances allow him to predict that Quattuor, the white wine of four whites of the house will be ‘superb’. The reason? The old varieties that compose it, in addition to Chardonnay, Arbanne, Petit Meslier and Blanc Vrai, are late to bud. They escaped the frosts of April, and as, on the Barséquanais further south, attacks of rot were early and followed by a beautiful summer so that they reached the harvest in good condition. Which is not always the case for these varieties, which can be a little capricious. 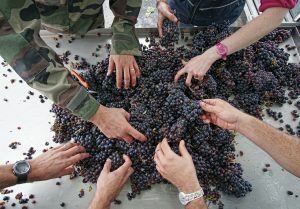 From the Montagne de Reims, the Pinots are of very mixed quality for oenologist Dominique Leboeuf. The clear wines of the Grande Montagne present with ‘beautiful aromas’. ‘We waited for diluted wines,’ he adds, ‘but, finally, they are not so much that way’. Oenologist Laurent Parizot joins him: ‘The Pinots are a little bit of a disaster because of the frosts. But on Verzenay, Mailly and the Grande Montagne, there are really pretty thing’s. For the moment, Cédric Jacopin shares his negative impression. ‘It’s very complicated. The problem of ACF (fresh mushroom flavours) is present as an earthy sensation, and it is inherent to botrytis. It’s hard to be precise about an inventory, for the moment, but I would say that 5 to 10% of clear wines are affected and they will be difficult to incorporate into the assemblage’. Unfortunately, there is no cure for the problem. For errant flavours, we find few examples in the Côte des Bar, estimates one broker in Champagne wines. For him, there are ‘beautiful wines’ and even ‘something to vintage’. This is a view shared by others. ‘We can say we are happy with the harvest,’ states winemaker Vincent Martin from Polisy. ‘Some would say we were lucky now, but we had no joy at the beginning of the year’. It is likely that 2017, ‘is not an exceptional year for Champagne’, but purchasers returned in good number in December, and the clear wines of the Côte des Bar were sought after..
‘The grapes picked at the beginning of the harvest are doing better,’ says Sylvie Collas, of J. de Telmont. ‘They are fruity and round but do not necessarily have a lot of freshness. The grapes picked later, even if sorted, sometimes give the impression of being at the end of the race. For all the clear wines, ‘ there is a lot of variability’. Dominique Leboeuf judges the Meuniers as being ‘pretty agreeable’ even if, depending on the sector, ‘we do not have what we usually get’. In general (Chardonnays, Meuniers, Pinots), he finds a tendency for the grapes to have resulted in ‘very aromatic and ripely fruity, with notes of candied citrus fruit and stone fruit’. This is not usual for base wines in Champagne. Not very widely planted in the Aube, the Meuniers also suffered a little. ‘They are ugly but we don’t have much,’ one hears. 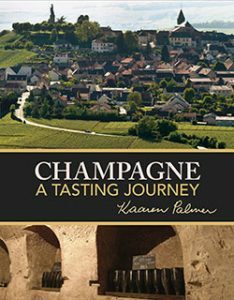 We see mixed fortunes in the different regions of Champagne. But beyond the differences between regions, we can also note two characteristics: the whites have enjoyed a better year than the other grape varieties and there is ‘a clear difference between grapes where there was grass between the rows and where there was not’. So remarks Michel Drappier. For him, the year 2017 looks like ‘nice plump fruit’, weakened by the weather near the end. Intense work at a Marne Valley sorting table above. Image © Victor Pugatschew.